Update: Red Dead Redemption 2 is official and there's a trailer out right now. You can watch the first Red Dead Redemption 2 trailer here. Below is the original story of the map leak we reported on back in April 2016. Original: The map for Rockstar's upcoming Red Dead Redemption 2 has leaked online, and been confirmed by our own independent source. The map was posted to NeoGaf by someone claiming to have received it from a source, before hastily pulling it down. But this being the internet, the map had already been immortalised, although many commenters questioned its legitimacy. A source close to the development of the new Red Dead game has now confirmed to us that the map is indeed the real deal, revealing that this is a "very recent" art direction map for the upcoming title. They also confirmed that the game will be set before the events of Redemption, and that the new map is just east of the one that featured in Red Dead Redemption. If you look at the bottom left (click to zoom) you'll see the Great Plains, home to the Blackwater settlement that sits at the top right of the Red Dead Redemption map - so you can see how the two come together. The lack of a railroad in the Great Plains, which featured in RDR, also points to this being earlier in the timeline. The new map also reveals that there will be caravan camps scattered around, again suggesting this will be a less occupied West. The overarching theme of Red Dead Redemption was the "death of the West", so a prequel, rather than a sequel, makes sense. The inclusion of New Bordeaux - bottom right - is another interesting inclusion. Mafia 3, which will be published by Red Dead Redemption publisher Take-Two Interactive later this year, will be based in New Bordeaux, a fictional location based on New Orleans. It will be interesting to see how much crossover there will be between the two games, but it also suggests we'll get some swampy areas in Red Dead 2. We're also interested to see the inclusion of islands. Although you weren't able to swim in Red Dead Redemption, the map makes us wonder if it's a feature that Rockstar has added to the next game. While we've referred to the upcoming game as Red Dead Redemption 2, the name is currently unknown - so start your guesses. Red Dead Retribution sounds good to us. We've heard murmurings about the new Red Dead game for some time. 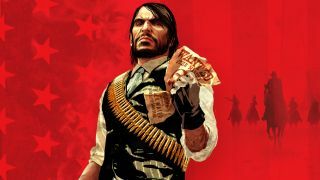 Two years ago, during an analyst conference, Take-Two CEO Strauss Zelnick said "it seems quite obvious that Red Dead is a permanent franchise". Rockstar did not respond to our request for comment on this story. We recently revealed that Grand Theft Auto 6 is already in production, and that Rockstar had at one point seriously considered setting a GTA game in Tokyo.